This plan does not follow the Six-Book Box Cycle. When you subscribe during a Six-Book Box cycle your first box will always begin with Book Box One, regardless of when you subscribed. 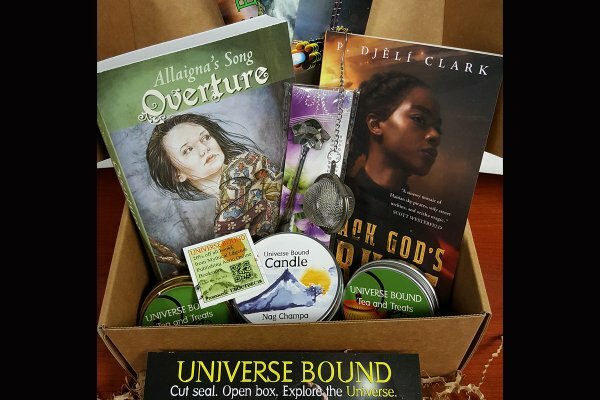 Click HERE for a breakdown of each Book Box. The current Six-Book Box cycle is from September 2018 to February 2019. Signing up in December will start you off as if you subscribed in September. You may change from a Six-Book Box Monthly plan to a Non-Book Cycle plan anytime. Send your request to service@universebound.space with “Switch to Non-Book Cycle Plan” in the subject line. When you subscribe to our Non-Book Cycle Monthly Plan your first Book Box will begin with the current month’s content. Click HERE for the current Six-Book Box month breakdown. The subscription rate is $32.99 per month. Shipping and handling is $12.95 per month. The total monthly charge with be $45.94. You must cancel before the next billing cycle. Canceling the subscription will only stop automatic payment for the next subscription. Refunds are not automatic. You must request a refund by sending an email, before the 15th, to Cancel@universebound.com. Include name and address. Please note: We will only issue refunds on multi-month subscription plans.